In the twelfth century a new religion took root in Europe which we know today as Catharism. The Cathars were Gnostic Christians. They claimed that their beliefs and practices dated from the earliest Christian times, and predated the innovations of the Catholic Church - a claim that is now recognised by historians as substantially correct. They had survived in Persia and gradually travelled westwards through the Byzantine Empire, the Balkans and Italy to Western Europe. The Catholic Church regarded Cathars as heretics. It was then a crime to disagree with Catholic theology and a capital crime if the disagreement was repeated. Cathars appeared throughout Europe, but it was in the Languedoc that they flourished, becoming the majority religion in many places. After a series of failed attempts to convert them by preaching and debating, Pope Innocent III called a full scale crusade against them. From 1208 a series of military campaigns were launched against the Cathars and their sympathisers, known together as the Albigensian Crusade from the erroneous idea that the Cathars were centred in the town of Albi. The local nobility of the Languedoc, vassals of the King of Aragon, along with the rest of the local population, sided with the Cathars. As the crusade progressed, Cathars and their sympathisers took refuge in castles and fortified towns, often located on spectacular hill tops in the foothills of the Pyrenees. Many sieges and a few open battles were recorded in detail by three chroniclers. After several generations of war the local lords were defeated and dispossessed by the (mainly French) Catholic crusaders. The Cathars were exterminated - burned alive by the hundred. The first Papal Inquisition ensured that there would be no re-emergence of the Cathar religion. Their castles fell into the hands of the victors, and the area was annexed to France. The castles were reinforced or rebuilt or destroyed. Some were turned into Royal fortresses but after a few centuries the borders of France moved even further south to the Pyrenees and the Royal castles were no longer needed for border defences and were slighted. 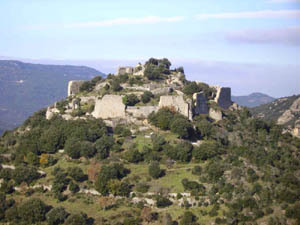 Today you can visit many so-called Cathar Castles in the Languedoc. A few, such as Carcassonne, have been restored. Many others are spectacular, romantic and unbearably poignant. They are a major tourist attraction. On the right at the top of the page is one of the most famous at Montségur. This was the Cathars' last real stronghold, which fell after 10 months of siege in 1244. 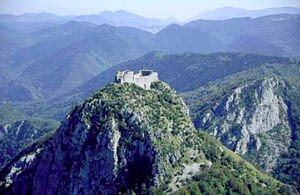 Most of the main "Cathar Castles" advertised to tourists as romantic vestiges of the Cathar period are no such thing. They are generally castles built by the French after the Cathar Crusade, and used to defend their new border with Aragon. These castles were slighted, or left to decay, after the Treaty of the Pyrenees in the seventeenth century. They are often built on the site of earlier castles occupied by vassals and allies of the Counts of Toulouse during the Cathar period. Broadly there are five categories of "Cathar Castle". 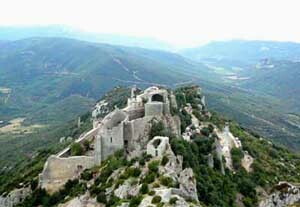 Genuine Cathar Castles, advertised as Cathar Castles: There are very few of these, although you may find a few vestiges near to existing structures (eg castles at Peyrepertuse, and Puivert). Carcassonne probably has the best claim to be a Cathar Castle, followed by three quarters of Lastours (Cabaret). 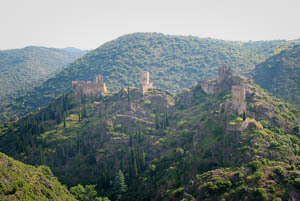 Later French Castles built on the site of Cathar strongholds, advertised as Cathar Castles: Coustaussa, Puilaurens, Montségur, Queribus, Termes, Aguilar and Saissac. 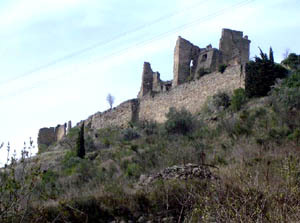 French Castles with no Cathar connections, but sometimes advertised as Cathar Castles: such as Arques. Cathar Castles not generally advertised as Cathar Castles although they are: Pieusse, Le Bézu, Usson. 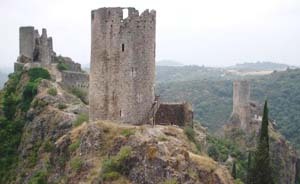 Sites of Cathar Castles: Béziers, Toulouse, Bram, Marmande, Lavaur, Minerve, Beaucaire, Castelnaudary. There are also castles of interest because of their links with events during the Cathar period, for example: Avignonet, where Cathar sympathisers helped some particularly unpleasant Inquisitors into their next incarnations. 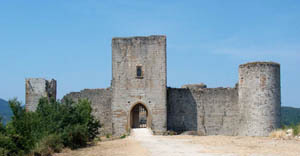 Villerouge Termenès, a castle belonging the the Archbishop of Narbonne, where the last known Cathar Parfait in the Languedoc was burned alive, and Montaillou, the home of Beatrice de Plannissols, a major character in the events following the arrest of a whole village by the Inquisition on suspicion of Cathar sympathies. 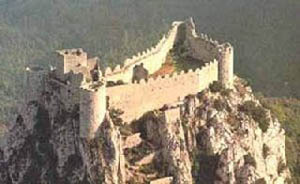 Click here for a summary list of Cathar Castles, with links to details, history architecture, phographs, plans and maps.